Bryan is our current team engineer and secondary wheel to wheel driver. He graduated from WMU with a B.S. in Mechanical Engineering and is currently pursuing his master's degree in Manufacturing Operations at GVSU. He currently owns a 1999 Mazda Miata, 1997 Eagle Talon TSi, and 1993 Ford F-250. Dr. Richard "Doc" Plank owns and finances the team and is our primary wheel-to-wheel driver. He is a WMU Professor Emeritus of marketing and current University of South Florida Polytechnic professor. He currently drives a 2010 Volkswagen Jetta TDI. 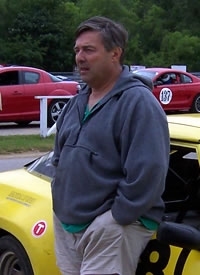 Sean is the current president of Bronco Motorsports and a High Speed Autocrosser. He joined in Fall of 2006. He currently drives a 2002 Ford Focus ZX3 and a 1976 Datsun 280Z 2+2 Turbo. Ivan is the current vice president of the team and a high speed autocrosser. Ivan joined in Fall of 2006. He currently owns a 1977 Porsche 924 and a 1993 Toyota Corolla.